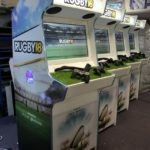 Towards the end of last year, we were approached by the team behind the new Rugby 18 game to create their very own customised arcade cabinets to feature in Rugby stadiums across the UK. 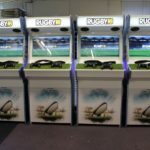 Using our Evo arcade as a shell, the Rugby 18 cabinets have been adapted to feature a PS4 base that runs the game.This is controlled via the PS4 pads at the front of the cabinet that replace the arcade joystick and button setup. 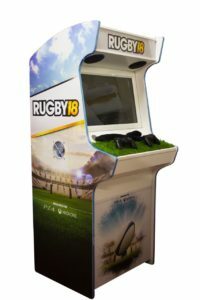 Designed with a Rugby theme in mind, the cabinets’ side and front graphics include the games signature logo and even feature a modified control panel that has been covered with AstroTurf for a more authentic playing experience. The cabinets can now been seen up and down the country at the home of some of starring teams. 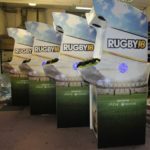 These include: the Newcastle Falcons, Gloucester Rugby, Wasps, Sales Sharks and England RFC. 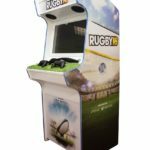 Released in October 2017, Rugby 18 allows you to compete in major national Rugby tournaments with the most prestigious teams. Featuring a career mode, you can build your dream team from a choice of over 2,000 players. Coming with local and online multiplayer, you can challenge your friends at your favourite game! 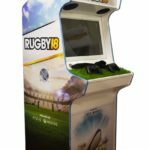 To find out more about Rugby 18 be sure to check their website here. 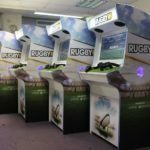 Our arcade machines are fully customisable as you can see from the above project! If you’d like to discuss a custom order be sure to get in touch.